Rochester and Chattanooga won laughers, Cedar Rapids split a double-header that included the suspended game from Wednesday night, Fort Myers won a close one, the GCL Twins snuck a win out and also Elizabethton was smoked 0-9. Can’t win them all. Rochester blasted Toledo 15-2 thanks in part to five early runs and a big eight-spot in the sixth inning to really break things open. The Wings offense was on fire, collecting 19 hits including four doubles and three home runs. Seven Rochester players had multiple hits. Jon Kemmer was 4-for-5 with a double, a home run, three runs scored and a strike out to lead all Rochester players. Just behind Kemmer was Kennys Vargas, 3-for-5 with a home run, five RBIs, a walk and two runs scored. LaMonte Wade had the other Red Wings home run as part of a 2-for-5 night that included three RBIs and a run scored. Byron Buxton was 2-for-6 with a double, two runs scored and two strike outs. Starter John Curtiss went just 1.2 innings before being replaced by Fernando Romero. Curtiss went 1.2 innings, gave up a pair of hits and two walks, striking out one. Romero went 5.1 innings, gave up two runs (one earned) on seven hits. He struck out five and walked one. Ryan Eades pitched 1.0 inning, gave up a hit, a walk, and struck out two. Ryne Harper pitched the ninth inning striking out a pair and not giving up any walks, hits, or runs. Chattanooga stomped Mississippi, scoring five runs in the third inning to race out to a big lead, adding to it with three more in the sixth inning, and added two more in the ninth after giving up a run in the bottom half of the eighth. The Lookouts were powered by the bottom of their lineup with the 7-8-9 hitters accounting for seven of the club’s eleven hits. Luis Arraez was 2-for-4 with a pair of runs scored and a pair of RBIs as well as a walk and a strike out. Jimmy Kerrigan led the club with three hits in five at bats. Jordan Gore was 2-for-5 with a double and a run scored, an RBI and he struck out twice. Brent Rooker was 1-for-5 with a single, a run scored, and two RBIs but stuck out three times. Starter Dietrich Enns went 6.0 innings, gave up just five hits, walked one and struck out eight. Williams Ramirez gave up a run over 2.0 innings and struck out five. Anthony Marzi finished the game pitching the final inning. Fort Myers scored the go-ahead run in the bottom of the fourth inning and held on to defeat Charlotte 2-1 in front of the home crowd. The Miracle are now just a game under .500 on the year at 60-61. Michael Pineda started, as he continues to come back from Tommy John surgery, going 3.0 innings. He gave up two hits, a run and struck out one. Pineda left with the game tied and earned no decision. Kevin Marnon pitched 2.0 scoreless innings and earned his first win of the year while striking out a pair of batters. Andro Cutura pitched the final 4.0 innings. He earned a save, gave up just one hit and struck out three. The Miracle offense picked up six hits, led by Jose Miranda who was 2-for-4 with a double and an RBI. No other Miracle batter had multiple hits, but Alex Kirilloff and Ben Rortvedt made their lone hit count, each had a double. The Kernels and the Chiefs each collected nine hits, but the Chiefs hung a four-spot on the boar in the top of the eighth to win the contest. Ryan Jeffers was 3-for-5 with a run scored and a strike out, and Ben Rodriguez was 2-for-3 with a run scored, two doubles, an RBI and a walk. No other Kernels had multiple hits. On the mound, starter Randy Dobnak went 1.0 inning and gave up one hit and one strike out. Blayne Enlow went 5.0 innings, he gave up four hits, three walks, and struck out three. Calvin Faucher pitched the final three innings, he gave up four runs on four hits, walked three and struck out one. The Kernels earned a split in this double-header of sorts, winning the nightcap 4-0. After going hitless in the first game, Akil Baddoo was 2-for-3 with a double, a triple, and two runs scored. Ryan Jeffers was 2-for-3 with a double and an RBI. The only other Kernels hit was another double from Ben Rodriguez who was 1-for-3 with a pair of RBIs. On the bump, Mike Acosta went 4.1 innings, giving up three hits, and no runs. He walked two and struck out five. Jared Finkel went 2.2 innings, gave up two hits, no runs and walked two, and getting credit for the win because Acosta did not go five innings to qualify (and whatever like 2.2 innings of relief is so great). Elizabethton managed just three hits in a 6-0 loss on Thursday night. The Twins didn’t help themselves out with four errors, but none lead to any Bluefield runs. The Twins picked up one hit a piece from Lean Marrero, Yunior Severino and pinch hitter Albee Weiss. Twins starter Tyler Palm was tagged with the loss, allowing four runs on four hits over 4.2 innings. Palm walked two and struck out three. Blair Lakso came on in relief and pitched 2.1 scoreless innings and Seth Pinkerton pitched the eighth inning and gave up a pair of runs, on four hits. He walked one and struck out two. A very strong performance from the Twins pitching staff, recording 13 strike outs and walking just three while holding the Orioles scoreless. Prelander Berroa started and went 5.0 innings of one hit baseball, walking three and striking out nine. Michael Montero and Niklas Rimmel each pitched 2.0 additional innings of scoreless baseball keeping the shutout intact. In the batters box, the Twins managed just five hits, but turned hits into early runs, scoring one in the second and another in the fourth. Estamy Urena was 2-for-4 with a double and a run scored, and Hunter Lee was 1-for-4 with an RBI. Why is laMonte Wade in the minors and Field is in the majoy. Does the FO know what the minors are for? Last night I was St Louis and went to the Cardinals and Nationals game. Can you imagine the twins ever bringing up somebody that is 19 years old and letting them play? Or calling on their minors and experimenting with their own players the way the Cardinals were. I believe the players deserve a chance the team that science them and puts them in the minors. For one Wade is not on the 40 man roster at present time.I agree with you, Wade is 24 and will be 25 in Jan. so it's not as if the F.O. needs to be worried about his timetable.I'm hoping we see him in Sept, but I doubt it.The outfield is full and Cave,Granite,Field are not likely to be dropped before years end. Great seeing Buxton hitting at Rochester.Also good seeing Arraez get 2 hits after three games with only 1 hit....total. Hopefully Fort Myers can keep winning.Good seeing Miranda and Rortvedt contribute.No need to mention AK as he has become automatic, day-after-day.Almost the same for Jeffers. Is Prelander Berroa someone we should be high on?Speaking of young unknown players, what do you guys have on Luis Gomez.I know he is a 17 year old shortstop from the D.R. who is the top hitter for the DSL Twins.Was he a big dollar sign a year ago? My biggest take away was Grossman was going on a rehab assignment.I have not missed him at all the in the big league lineup. Nice last two outing for Enns. I am shocked he's still here but I suppose he's improving. And hey Lookouts, how about spreading those runs around over a few games lol. Starter John Curtiss went just 1.2 innings before being replaced by Fernando Romero. Curtiss went 1.2 innings, gave up a pair of hits and two walks, striking out one. This is probably a quibble, but the word "just" suggests some kind of disappointment. I expect the outing went as planned. He went through the opposing batting order exactly once. They seem to be trying out the concept of an "opener" as opposed to "starter", and this is how it will go when successful: get what you can out of your talented but limited pitcher, and move on to the longer guy according to schedule. For one Wade is not on the 40 man roster at present time.I agree with you, Wade is 24 and will be 25 in Jan. so it's not as if the F.O. needs to be worried about his timetable. 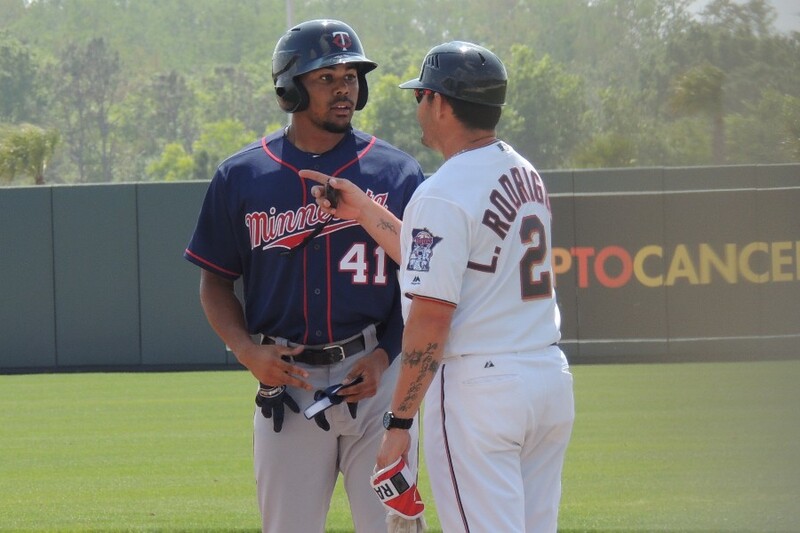 The other challenge is that he's a corner outfielder who's slugging .370 in 57 games at Rochester.For context, with the Twins this year:Grossman .365, Morrison .368, Adrianza .380, Mauer .358. Also, both Kepler and Cave are OPS'ing with the Twins better than Wade is with Rochester. I definitely don't want Wade not playing every day right now...so fine with him finishing the Rochester season.Would like to see him in September...but don't know if the roster math will make that practical. ...this may also be a bit of a quibble, but I don't think it went quite the way they planned, as he left the bases loaded! However, double bonus for us in that we got to see Romero in both a high-leverage situation AND get in an additional 5 innings! ...this may also be a bit of a quibble, but I don't think it went quite the way they planned, as he left the bases loaded! That's fair, and was/is worrisome. But, they stayed the course, and brought in the fresh arm to attack the top of the order, second time through, so it worked out. I guess you are right in that 'the plan' was to have the starter come in (when appropriate) during the middle of an inning! I am not sure I like this idea (i.e. designated starting reliever), but can you imagine some of the pairings that you could generate by having a scheduled day to use a reliever? For instance could you imagine pairing Brusdar Graterol with Jamie Moyer (vice-versa, actually)? I bet Moyer could handle that role even now! "Michael Pineda started, as he continues to come back from Tommy John surgery, going 3.0 innings. He gave up two hits, a run and struck out one. Pineda left with the game tied and earned no decision." I am using my best pink crayon to write Michael Pineda into next year's starting rotation. Depending, he could either start, or finish games for this team. Yeah, I've kind of been wondering if we're not getting a little too excited about Wade similarly to how Granite had favored status here back when. I think Wade is a better prospect. He has a bit of power and great plate discipline. Not sure how they rate defensively. If not for Cave, I think Wade could take the Grossman role in 2019. Or Cave takes Grossman's role and Wade takes Caves role.That's start the season at Rochester and is available to move up if/when they need a replacement for an injury for a week, month or as it turned out with Cave, a season. Yeah, I think you're probably right, but I still think maybe we're too confident about Wade's future around here. Speaking of young unknown players, what do you guys have on Luis Gomez.I know he is a 17 year old shortstop from the D.R. who is the top hitter for the DSL Twins.Was he a big dollar sign a year ago? Gomez signed for $175,000. He and 1B Victor Heredia, who got a bonus of $180,000, are both lighting up the DSL. Gomez would be second in the league hitting if he had enough at-bats to qualify, hitting over .500 the last ten games. Heredia leads the league with 54 RBI's and has the 4th best B.A. and slugging percentage. Granite has been slowed by injuries but at his peak was probably better, since he can play CF. Wade doesn't have enough game power to maintain a high OBP in the Majors . . . he will have to do more damage on balls in play to succeed.